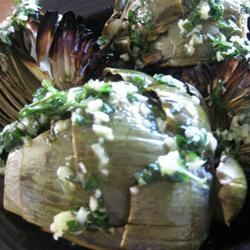 These flavorful artichokes with their butter, garlic and shallot taste are sure to please any artichoke fan. I especially like the smokey flavor the grill adds. Meanwhile, bring a large pot of water to a boil. 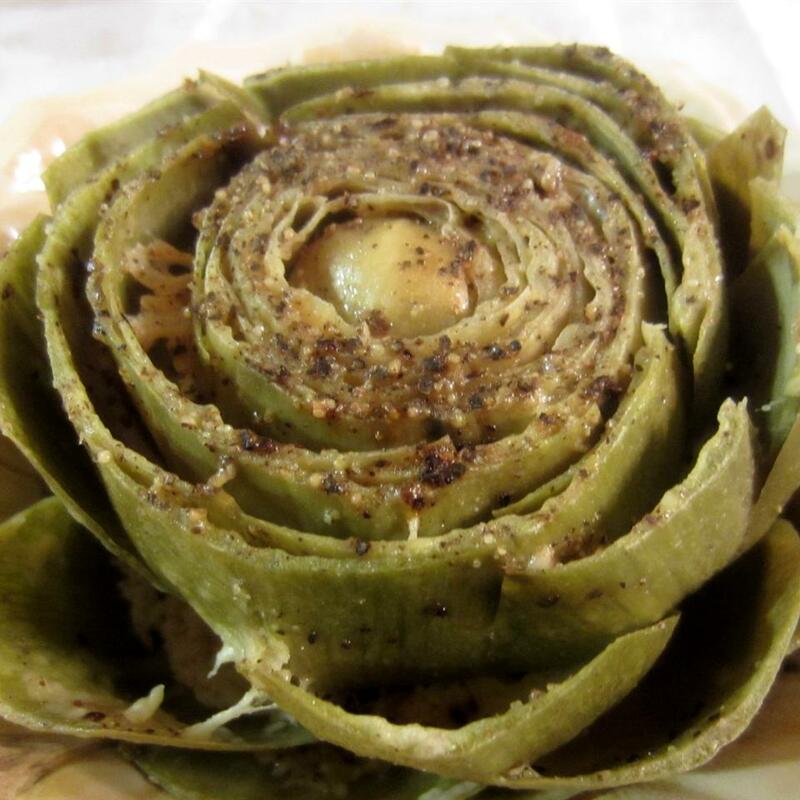 Place the artichokes into the boiling water, and season with salt and pepper. Throw in half of the garlic, and half of the shallot. 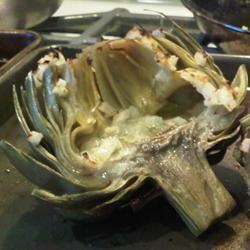 Boil for about 30 minutes, or until a fork is easily inserted into the stem of the artichokes. Drain and set aside. Melt the butter in a small pan over medium heat, and stir in the remaining garlic and shallot. Cook just until fragrant, then remove from the heat. 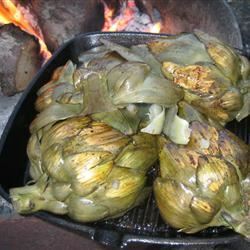 Place the artichoke halves onto the preheated grill. Brush some of the melted butter onto them. 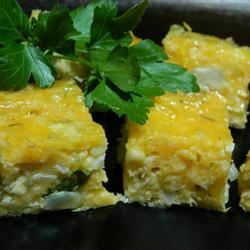 Cook for 5 to 10 minutes, brushing with butter occasionally, until lightly toasted. 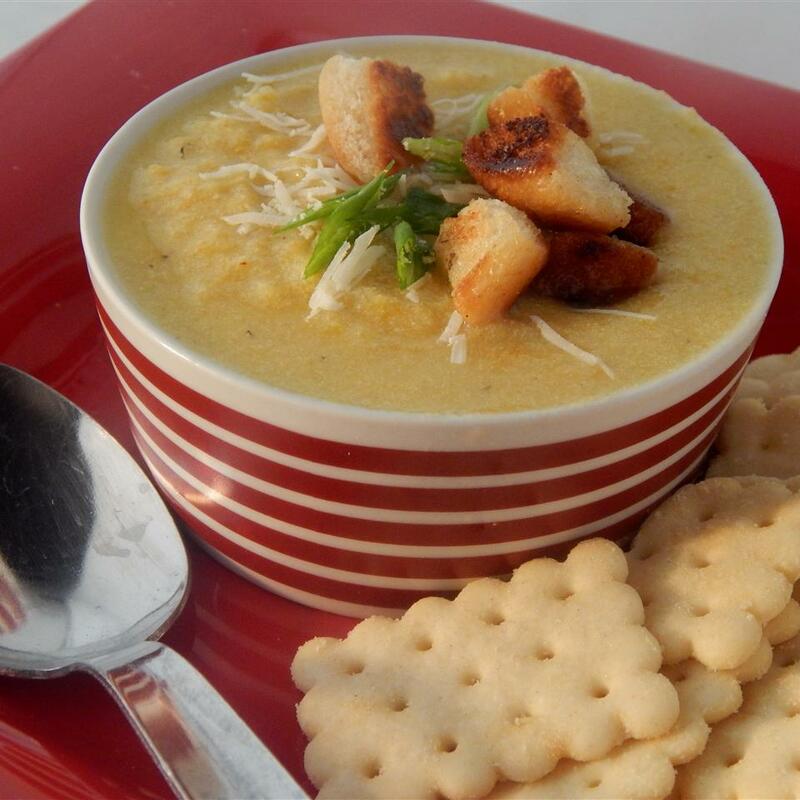 Serve with remaining butter as a dipping sauce. I thought these were great. 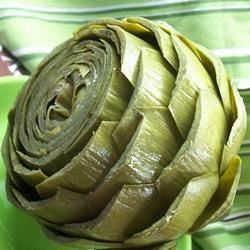 I did refer to my cookbook as to preparing the artichoke before boiling it - removed the choke removed the discolored leaves cut the top inch or so off the artichoke and then snipped the tips off the remaining leaves. 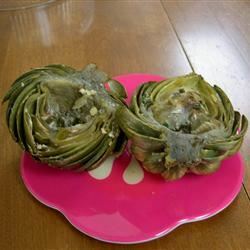 Maybe I just don&apos;t like artichokes. I&apos;m a first-timer and this was sooooooo bland. How can that much butter and garlic be so blah? 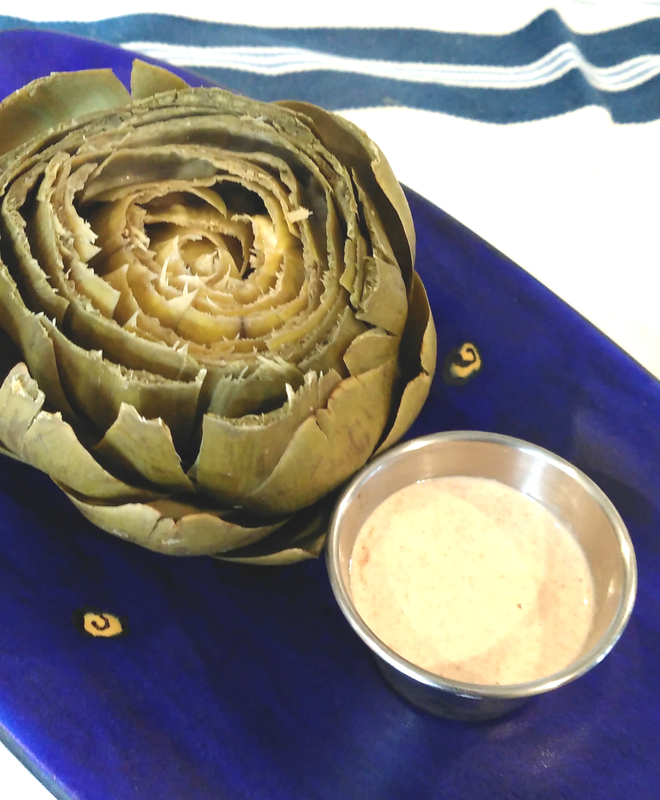 This is my first time making artichokes and theses were sooooo amazing and easy. The grilling really does make a difference. These were better than I&apos;ve had in a restaurant and my boyfriend said they were the best he&apos;s had in his whole life. 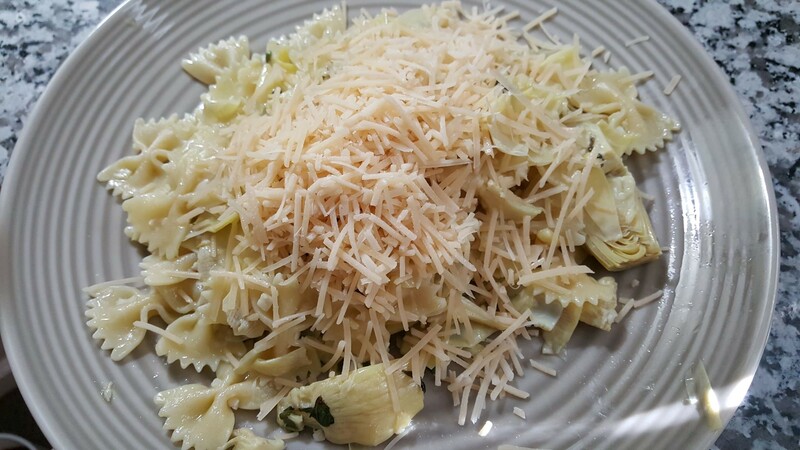 I used more garlic and shallot than called for and it turned out great. 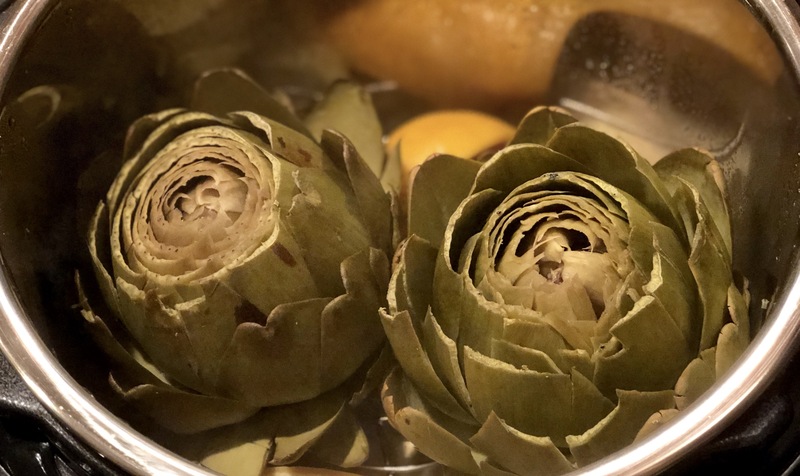 A tip to keep your artichokes under water while boiling is to invert a steamer on top of them. 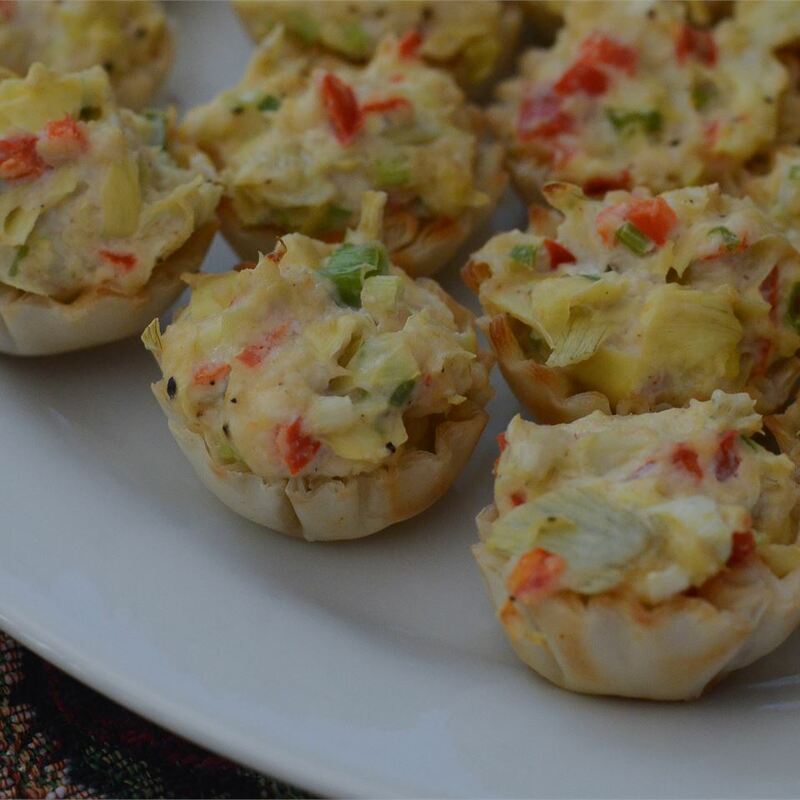 Serve as well with mayonaise and fresh lemon wedges for a variety. Oh and by the way a great way to remove the choke is to use a grapefruit spoon (if you have it)- it&apos;s easy to get it out whole that way! Hope this helps! The garlic butter dip was a big hit. Since it started to rain we moved the grilling indoors to the broiler. 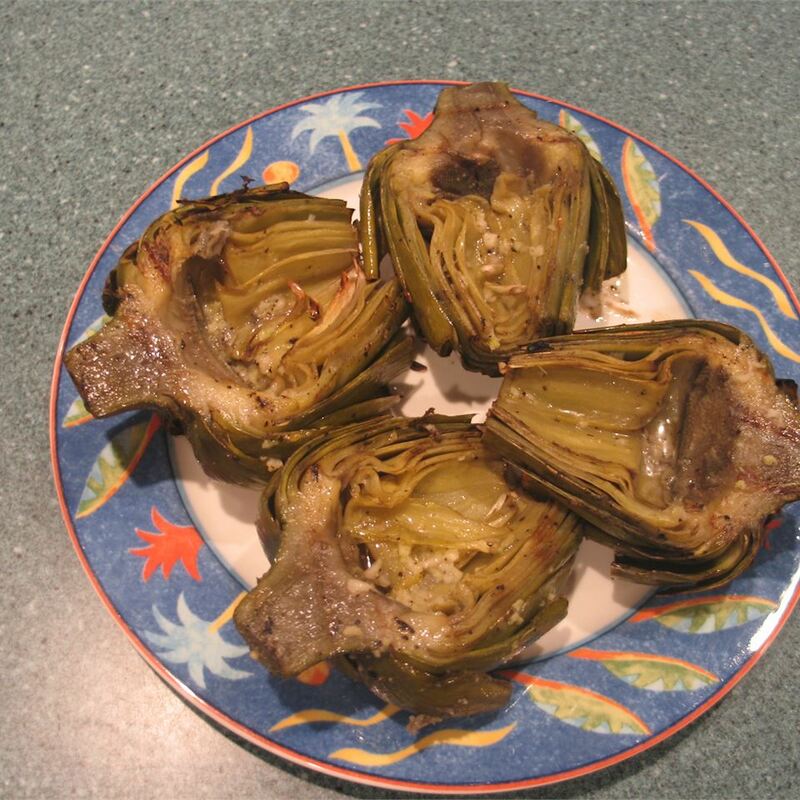 I just broiled the artichokes for about 5 minutes and they were still great. This was wonderful. I added a bit more garlic and shallots. Also right before putting them on the grill I put balasmic vinegar over top. 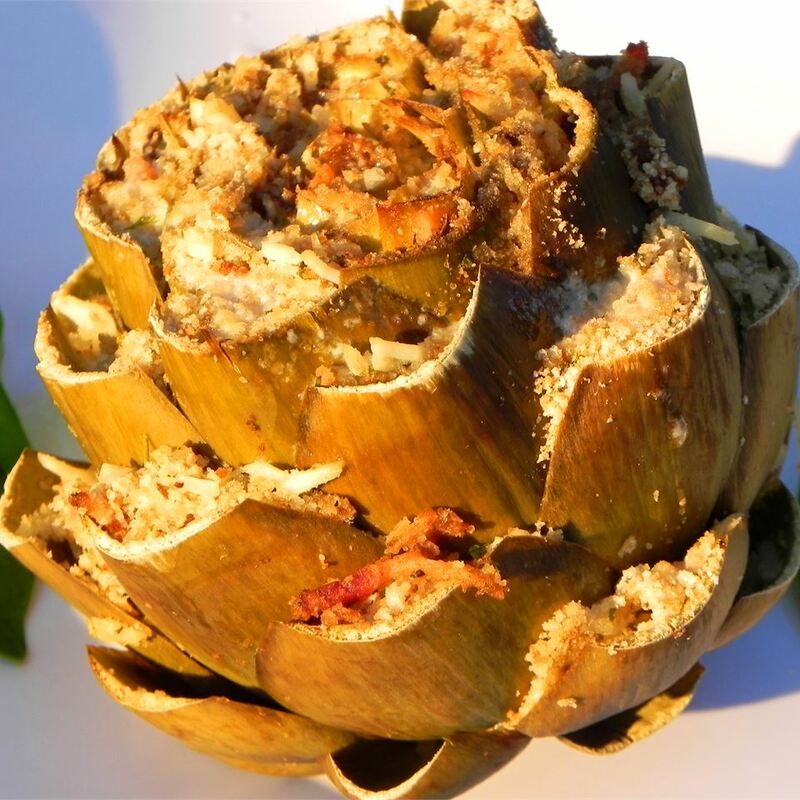 I don&apos;t think I will artichokes any other way from now on this is the way to go. Hate to toot my own horn but I can&apos;t get enough of these. 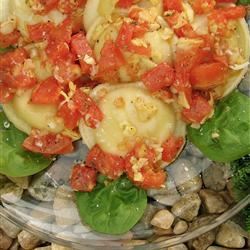 Try sprinkling a little grated parmesan on the grill after basting with the butter. I love shallots now on everything. This was great and easy. 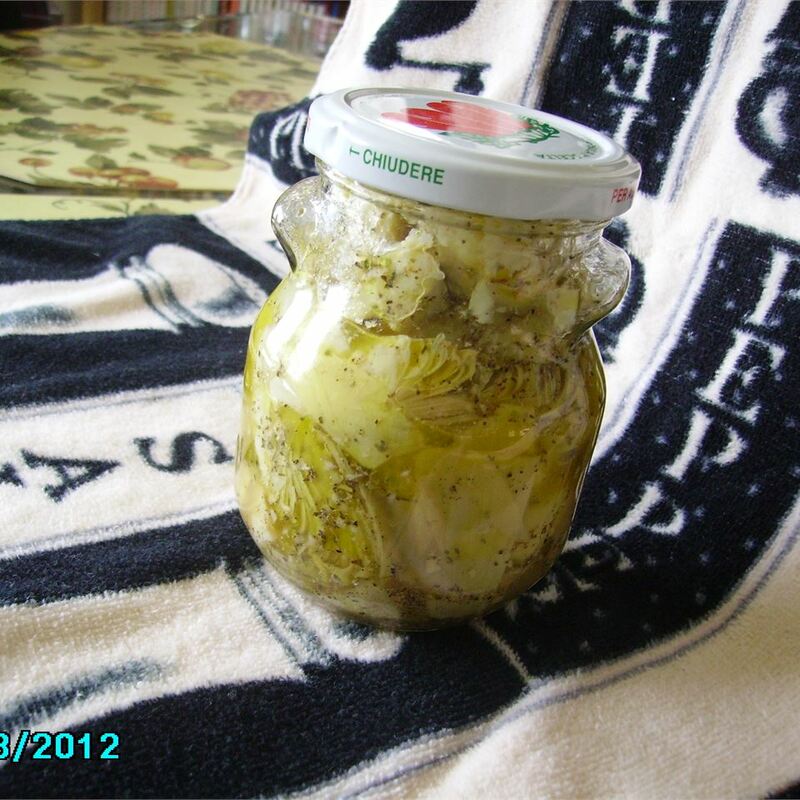 I made it for my visiting family who come in from artichoke country of Monterey California area. They enjoyed the Texas mesquite smoke flavor from our grill. (We use only wood not gas) I added half an onion to the boiling water and 1/2 stick real butter with a squirt of lemon and sea salt. I trimmed the sides and top and it had a great presentation as well. I served with lemon cilantro butter and cilantro mayo but they enjoyed then as they were. I will definatley do this again when entertaining. Thanks for the great recipe. YUMMERS! 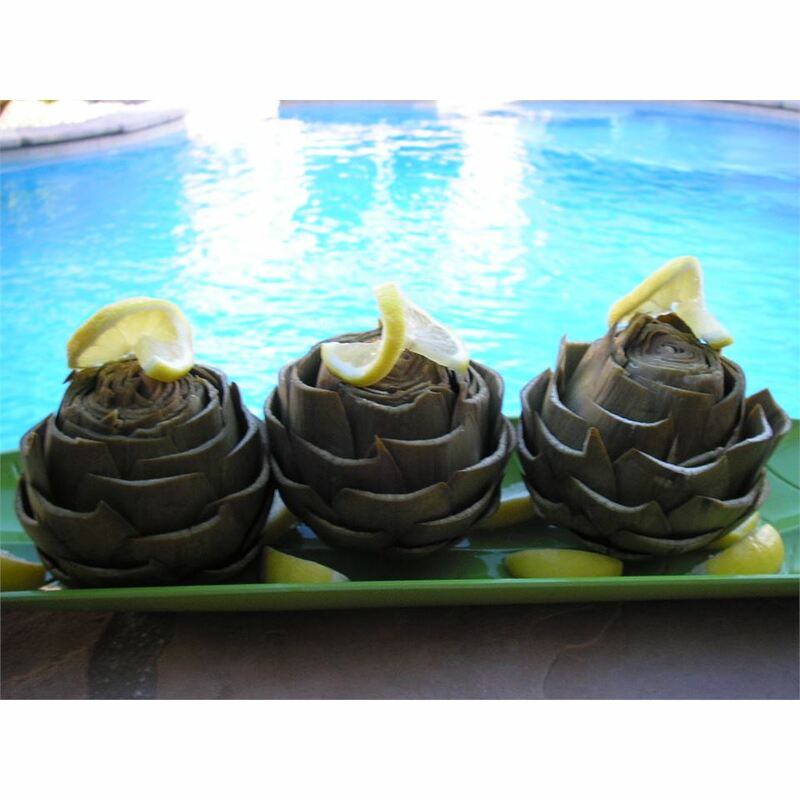 My kids have been addicted to artichokes since they were in pre-school but unfortunately they can be so darn pricey. So being that we had no kids for dinner tonight we decided to treat ourselves. I too steamed them and loved the fact that they were cut in half prior to cooking. Never did that before. Both hubs and I are big on garlic and onion and don&apos;t care about bad breath as long as we&apos;re both eating it! 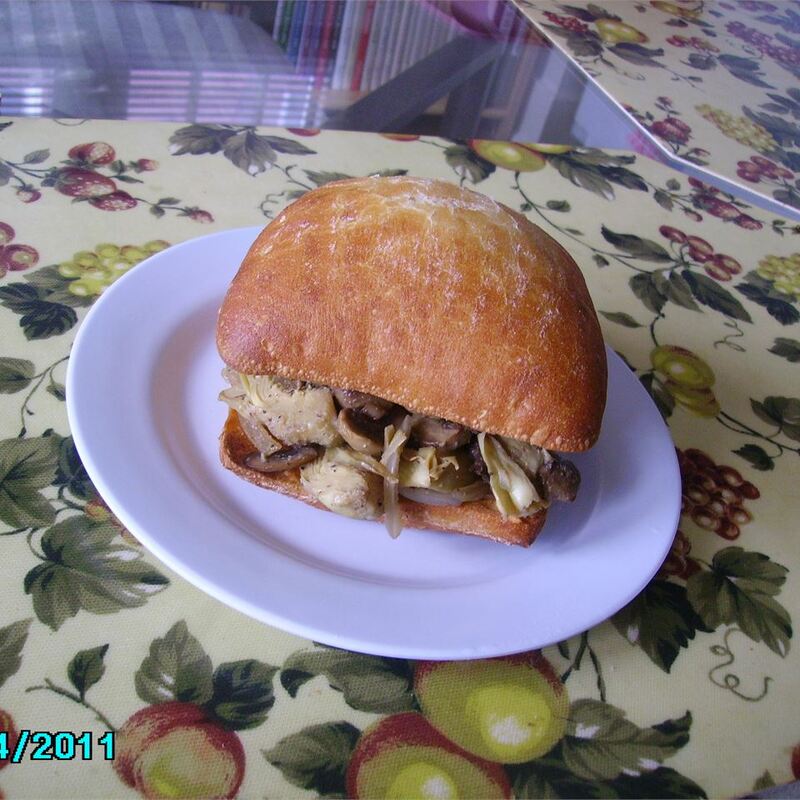 Great recipe Nina and thank you!! These are fantastic. I used foil on the grill which helped them not fall into the coals and also used ridiculous amounts of garlic and shallot. 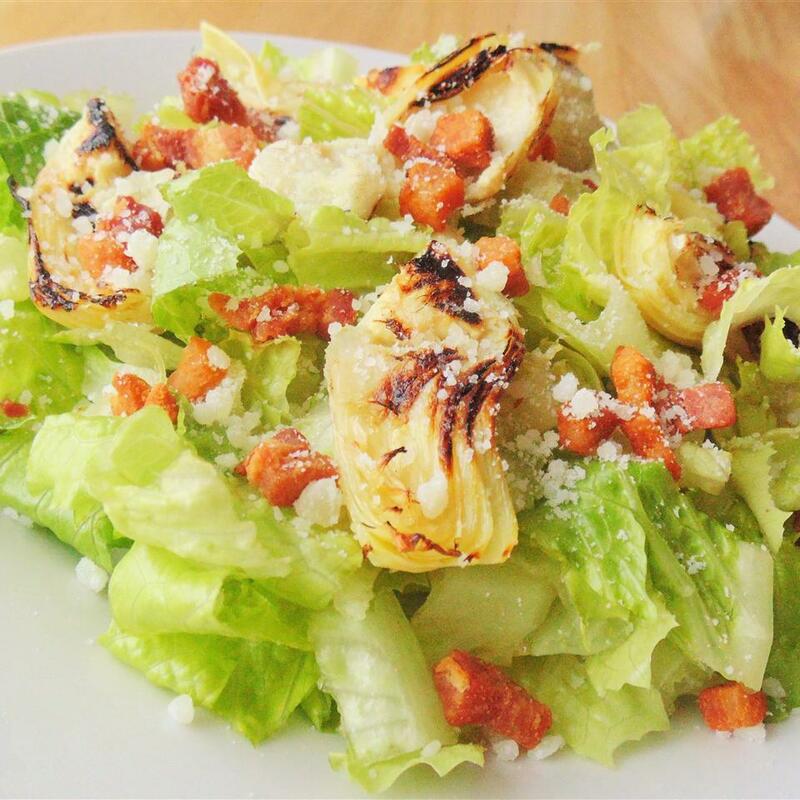 We&apos;ll definitely make these again. Pretty good. I felt it could use a bit more flavoring however. 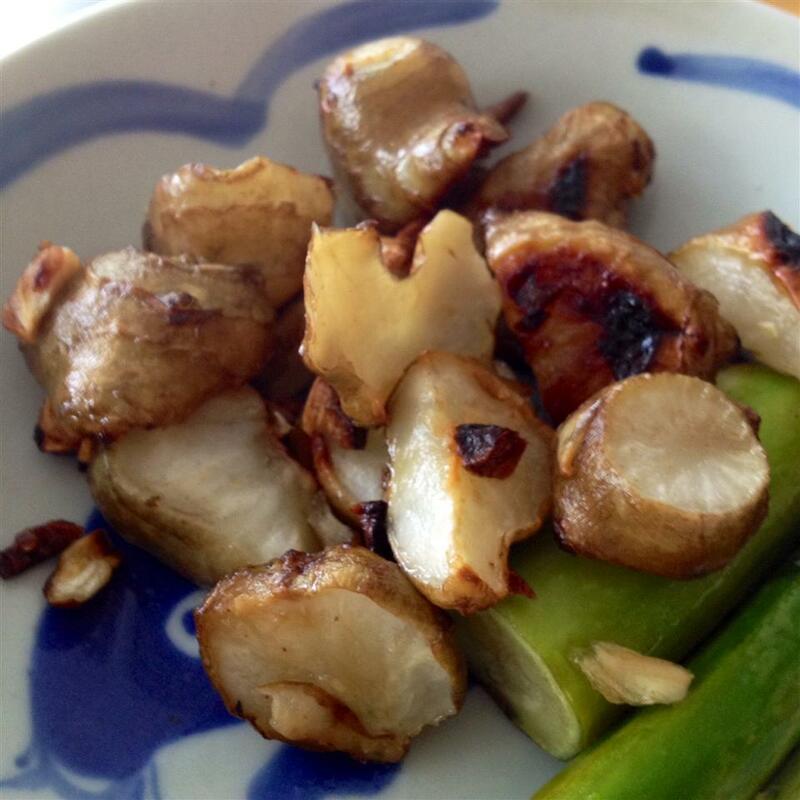 Also be careful when putting them on the grill after removing them from boiling water. Mine were VERY tender (yummy) but accidentaly dropped a few on the floor. After the fact I almost think putting them on foil and then placing on the grill would be a better idea. 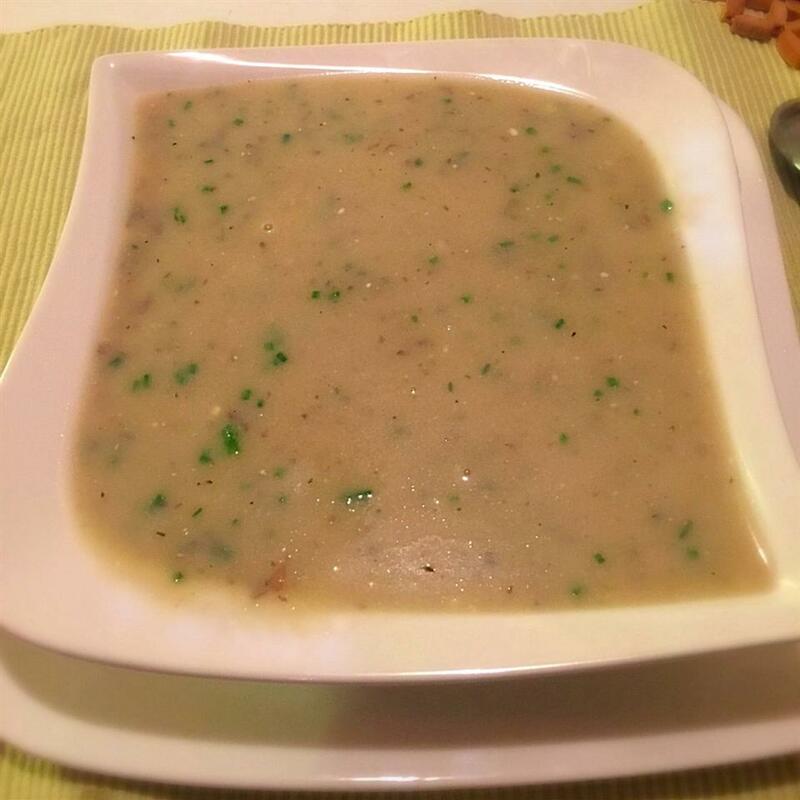 The garlic and buttery taste is great. Overall I&apos;d give it 4 stars for flavor but 3 stars (which I&apos;m giving) for the vague directions.